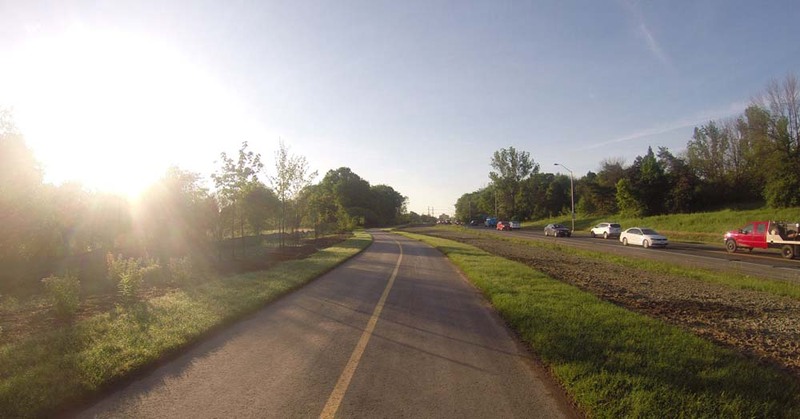 The Sawmill Creek Pathway extension is completed and it’s fantastic! It now connects to the Brookfield Path at it’s northern end and runs south as far as Hunt Club Road. I’ve hi-lited the pathway in green. The blue line is the route I followed to get to and from Centretown. 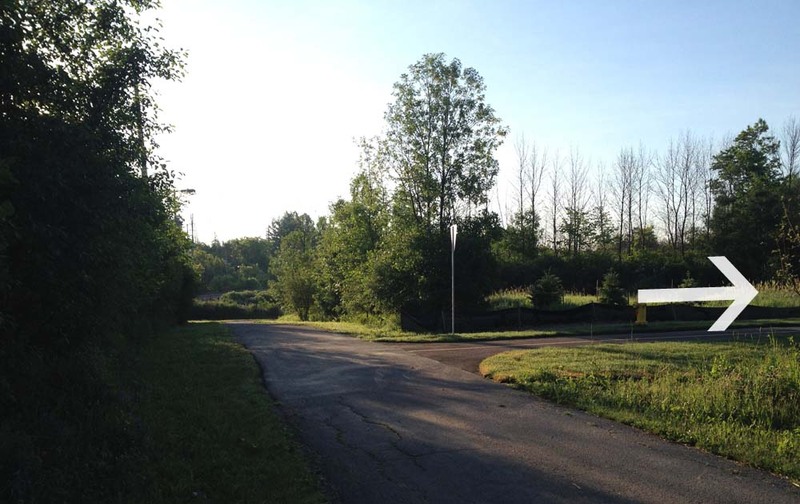 Here’s where the Sawmill Creek Pathway begins along the Overbrook Path, just east of the train tracks. Below are a few images of the pathway. Fresh pavement and fresh planting! Alongside Airport Parkway for a short spell. Under Walkley beside the Transitway Station, which was the northern end of the path before the extension. The path ends at Hunt Club. Unfortunately the transition from here to anywhere else is pretty rough. On a previous occasion I turned east on Hunt Club to get to South Keys mall. To do so I stayed on the sidewalk for a short distance before cutting left through the parking lot just beyond the train bridge. UPDATE, Summer 2015 – The Airport Parkway Bridge opposite South Key Mall opened in 2014. See this post for more. An access to South Keys Mall has been created via a short pedestrian tunnel under the O-Train tracks a bit south of the pedestrian bridge. Signs are confusing but I checked with OC Transpo – bikes are allowed through the tunnel but walked, not ridden. On this occasion, I chose to head west along Hunt Club. the transition across the transit way and Aviation Parkway off ramps was rough. Once beyond these spots there is a bike lane, however it doesn’t start for a few hundred yards. All very complex, so I prepared this little video to help explain. The video starts where the Sawmill Creek Pathway ends. So apart from this nasty little section, the extension of the Sawmill Creek Pathway and the bike lane further along Hunt Club allows for a fine link over to Uplands Drive and areas south of the city. Thanks for the blog. I’m trying out this path today and was glad to confirm that I could access the North end at Brookfield. 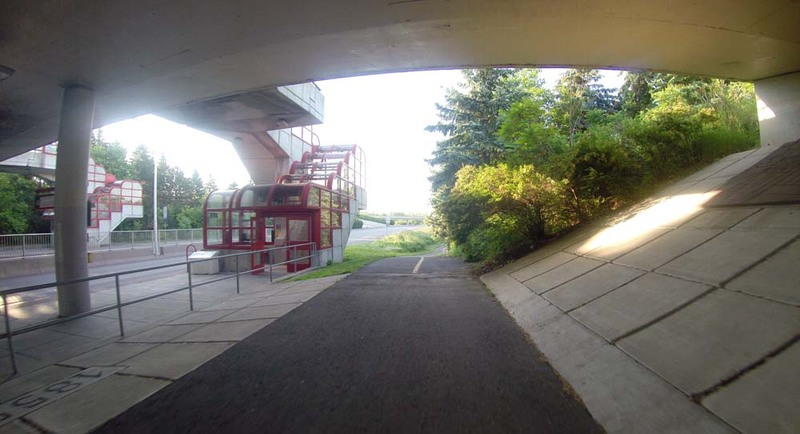 Garmin Connect showed a path but Google didn’t so I thought I might have to finagle my way around Glenhaven Private and climb down the Transit Station. Happy to see it’s not necessary. The extension is indeed a great link, making access to the Sawmill Creek Pathway much more convenient. Previous Previous post: Artistic Renderings of Canines in the Capital: The Unofficial Tour, or, Places Around Town That Are Going to the Dogs!